The information in this dataset covers almost 800 employees and is taken from a register that was maintained in the Permanent Way Inspector's Office at Millers Dale. It initially covered men who were employed at locations between Ambergate and Buxton Midland / Chapel-en-le-Frith (part). Boundary revisions in later years resulted in places like Butterley and Pye Bridge being added, although these and odd other locations were subsequently transferred to other districts. The register appears to have been started in the first decade of the 20th century and was in use until the early 1960s. However, not every event was recorded, especially during the wars, so there are few complete records. In odd cases, there are entries for two or more different people with the same name. In order to differentiate them it has been necessary to add a number after the forename(s) – e.g. John (1) and John (2). Addresses are recorded in the register, but are not included in these extracts. Similarly, rates of pay - which are not particularly comprehensive - have also been omitted. Unless otherwise stated it is to be assumed that all men were Platelayers. These were referred to in the register as Labourers initially, but in later years as Undermen and Lengthmen. The home stations and gang numbers are generally those that applied when the register was started or when the men were taken on / first entered in the ledger. There were re-numberings and adjustments to the composition of certain gangs from LMS days, in some cases with a change of home station. 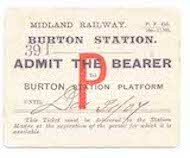 From time to time, the Midland Railway initiated cost savings by reducing the number of posts and dismissing the occupants. This was particularly noticeable in 1908 and from 1919 to 1921. Additionally, a number of men were not re-employed by the LMS following the General Strike of 1926. A feature of engineering staff ledgers was the inclusion of specially printed columns relating to accidents. The often dangerous nature of the work can be determined from the number of entries made in these columns – some people being particularly accident prone – while several deaths were also recorded within this relatively small number of staff. Details of staff joining HM Forces in WW1 and their subsequent re-employment afterwards appear to be quite comprehensive, while there are also entries relating to those who were killed in action. It will be noted that certain staff were taken on, but then failed medicals, quite often the result of eyesight defects. This feature was particularly noticeable after the end of World War II and men who had been in the Forces during that period were considered unsuitable for the type of work undertaken by Platelayers. Many entries in this section are abridged versions. This is partly due to their length. However, if you believe a particular person is one of your relations then please contact the Study Centre Co-ordinator as detailed below, who will provide you with all known information.